BMW M doesn’t just manufacture high-performance automobiles. BMW also makes state-of-the-art, high-class bicycles. The Bavarian automaker has a bicycle division in Munich and has been manufacturing them for over 60 years. They just made a special BMW Cruise M Bike Limited Edition to pay tribute to the newly-launched BMW M2 Coupe. It even comes in the M2’s official color, Long Beach Blue metallic. BMW says they turn bike riding “into a very special experience” just like they do their M performance vehicles. What sets this bike apart beside the M2 official color? It features a number of high-quality technical components, like a carbon seat post and spacer which saves weight and is also strong. It gets larger wheels (28 inches), a 30-gear system and Shimano hydraulic disc brakes. BMW says it will carve twisty mountain trails just like the M2 carves the tight curves on the track. 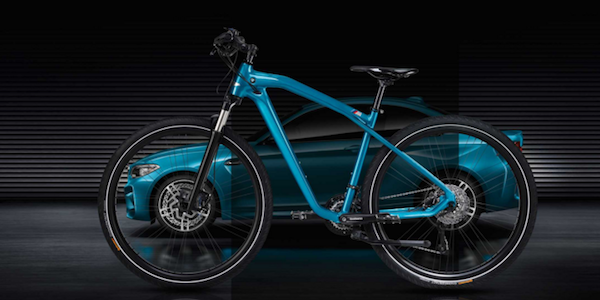 The cost of the new BMW Cruise M Bike Limited Edition is surprisingly less than what many mountain bikes cost. Mountain bike enthusiasts will pay anywhere from $2,500 to $6,000 plus for a high quality stump-jumper for navigating fast trails, totally pinned descents, and huge days. It may not be totally made of Carbon, but the BMW Cruise M Bike Limited Edition will likely be a hit because it pays tribute to the new 2016 BMW M2 Coupe. It will be exclusive and produced in a limited run of 1,500 units. How much will it cost? BMW Cruise M Bike Limited Edition: 1,400.00 Euros ($1590 US). It would look good sitting next to a new Long Beach Blue metallic M2 Coupe in the garage. We can just see an M2 with a bike rack on top heading to the mountains for day on the trails this summer.